Mayor Kim Seung-Su of Jeonju has been re-elected and we should send him a message of congratulations. We have learned from SaveKoreanDogs.org, that Mayor Kim is young, charming, and vegan, and is willing to turn his city into a “Dog Meat- Free City”. 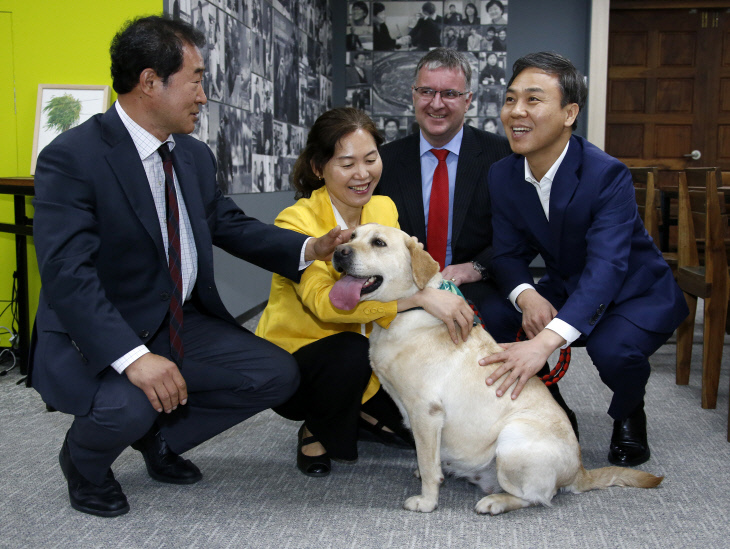 Following Bucheon, his city will be the second city in South Korea to become dog meat- free. We support him in this endeavor and thank him for making the courageous and compassionate decision. Please send a quick email or postal letter to Mayor Kim today. You can use our suggested letter below or your own words. Click HERE to learn more about the recent collaboration between Mayor Kim and the Korean activists. We send you many congratulations on your re-election as Mayor of Jeonju. This is great news, and, as we know, well-deserved, in particular for your hard work in enabling the closure of the illegal dog farms and slaughterhouses within your City. We understand that this is the first step in your commitment towards making Jeonju a ‘dog-meat-free’ City. We look forward to that day, and sincerely thank you for your progressive leadership in acting on behalf of the defenceless animals in your City. The world needs more upstanding people like you – thank you, Mayor Kim. Video: Several buses with the anti-dog meat message are operating in Jeonju, thanks to SaveKoreanDogs.org, Actions for Animals (Jeollabuk-do Group), and supporters like you. Photo: SaveKoreanDogs.org. The City of Jeonju and Animal Protection Group Work Together to Send Rescued Dogs from Osongje to Their Forever Homes! Thank you card praises for your leadership in fighting the dogmeat industry. Thank you for your compassion and kindness to dogs . You are a great human being . Take against this cruel tradtion. This is not a tradition: it’s a modern travesty, a modern barbaric, inhumane treatment of innocent living beings who deserve justice just like we do. Stop this horrific madness immediately. Poor helpless, gentle animals must have every protection possible from evil, sadistic people. Please save them from the horrific suffering. There must be harsh punishment for animal abuse of any kind. Thank you so much for helping all these innocent animals that are unable to defend themselves against the monsters of this world. Please keep fighting for more closures of these killing sites. WE ARE GOOD MEN!!! PLEASE NO CRUELTY FOR OUR BEST FRIENDS!!! Disgusting, soulless, heartless,h I wish I could be a fly on the wall when their judgement day comes. Thank you for your bravery and compassion sir. Thank you so much to be compasionate and human ! Sent a letter. I don’t think other Mayors who turn a blind eye to dog meat were ever congratulated for all over the world) Maybe Mayor Kim of Bucheon was. But, guys, don’t post it HERE, he won’t probably see it here, send a letter! It doesn’t take much time. No fear no pain for the voiceless ! Please stop the cruelty! These animals are the most loving beings… they are truly man’s best friend and I can’t imagine the pain they’re going through. Not only physically, but emotionally.